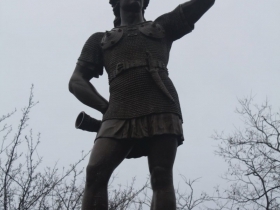 $150,000 in private dollars sought to restore Juneau and Leif Erickson statues. Solomon Juneau and Leif, the Explorer. Photos by Graham Kilmer. A local organization is raising money to restore the statues in Juneau Park, before it’s too late or too expensive. Juneau Park Friends, a non-profit dedicated to the preservation and renewal of Juneau Park, hopes to raise $150,000 for the restoration of the park’s two statues, Solomon Juneau and Leif, the Explorer. 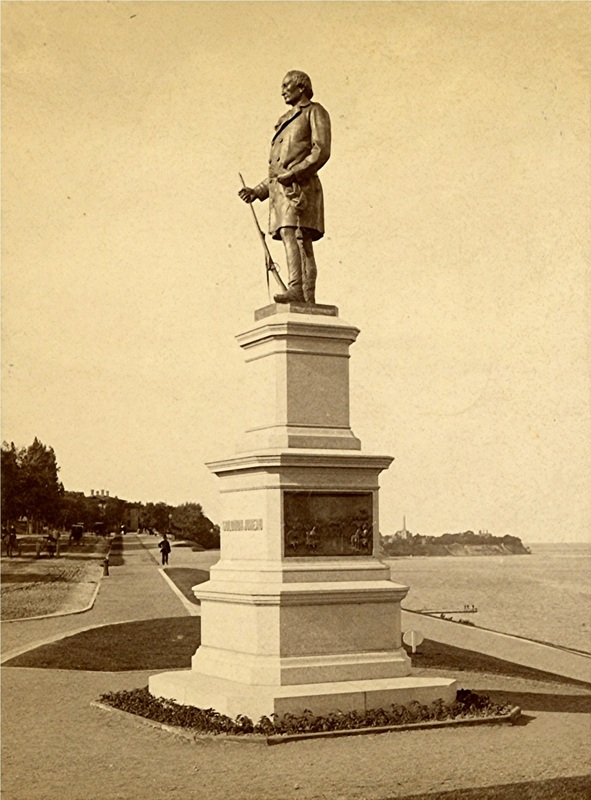 Solomon Juneau Statue, late 1880s. Image courtesy of Jeff Beutner. The statue of Solomon Juneau was unveiled back in July 1887 and the one of Leif Erickson was installed just a few months later that year. So both are 130 years old, and it’s been two decades since they underwent the delicate and expensive process of having their bronze restored, said Lisa Hatch, president of Juneau Park Friends. “What you can’t see from the ground is that the rifle that Solomon Juneau carries has severe cracks in it,” she said. Something he’ll need if the Bridge War ever heats up again. Milwaukee County owns the statues, but the county hasn’t allocated funds or created a plan for restoring them, she said. For now, the restoration will involve taking the old coating and patina off and adding a new coat. But along with raising capital for this latest round of restoration, the group hopes to start a fund that will allow for a regular cleaning schedule. 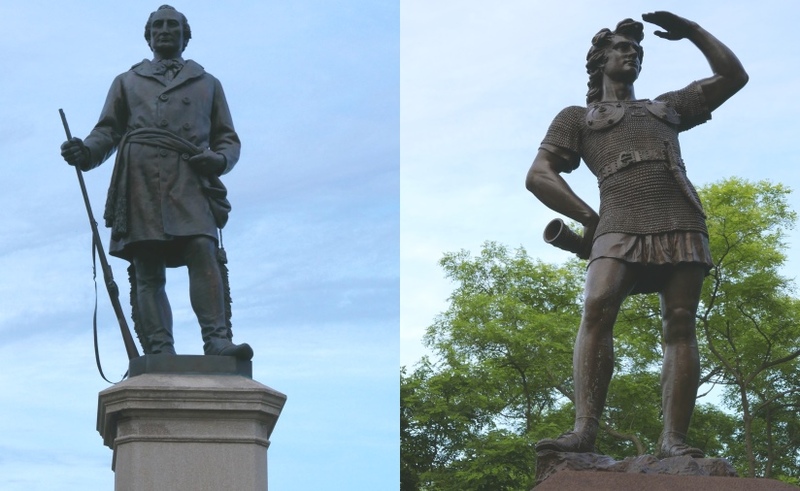 The coatings on the two statues are really only meant to last for five years. “The longer you wait to do it the more expensive it is,” Hatch said. So the $150,000 won’t address all of the problems faced by the statues, she said, like some stonework needed for the bases that have naturally been damaged by Milwaukee’s icy winters. 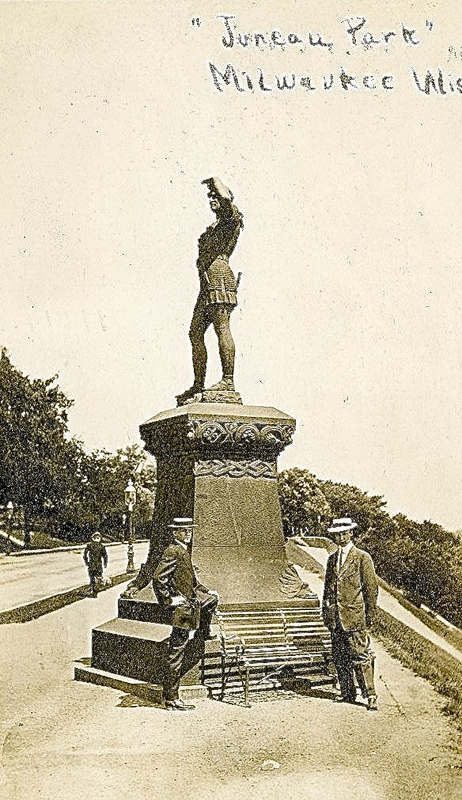 Leif, the Explorer and two tourists visiting Milwaukee, around 1910. Image courtesy of Jeff Beutner. Conservation of Sculpture & Objects Studio, Inc., based in Chicago, did the latest restoration 20 years ago and they’ve been chosen again for the work this time around. 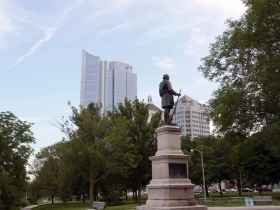 The company is also currently restoring the George Washington Statue at the Milwaukee County Courthouse. 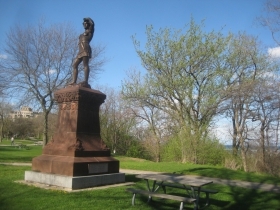 Juneau Park was Milwaukee’s first official park. And the Juneau Statue was commissioned by local businessman William Metcalf and Charles Bradley specifically for the park. This area of the city, known as Yankee Hill, was first developed by Juneau himself. 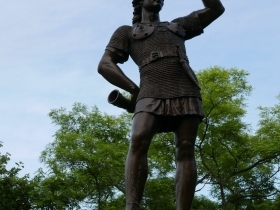 Leif the Explorer was commissioned by Joseph Gilbert Thorp, a 19th century Wisconsin State Senator, and his wife. Anne Whitney sculpted the statue at a time when few women were given commissions like the statue. 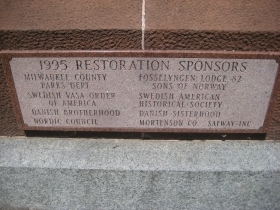 The statue has been an important landmark and cultural attraction for Scandinavians since its dedication. 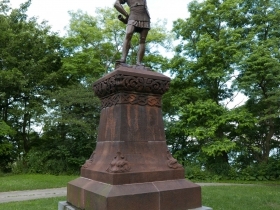 Hatch said it’s rumored that in 1893, when Chicago was holding the World’s Fair, Norwegians sailing their longboats through the St. Lawrence Seaway to Chicago first stopped in Milwaukee to pay tribute to the statue. Right now, Juneau Park Friends is looking down the homestretch of their fundraising goal, with over $100,000 raised through grants and generous donations from private organizations and individuals. The old photos are historically amazing! The landscape and grounds around both statues looks nothing similar to today! Wonderful photos! Thanks! Very nice article on the needs of two sculptures in Juneau Park. 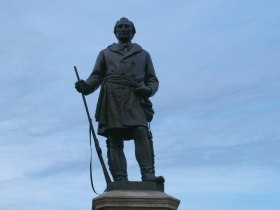 There is also a need to restore the George Washington statue on West Wisconsin Avenue, not the Courthouse. 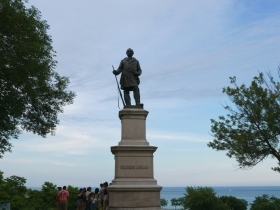 George Washington is the first statue erected in Milwaukee. The work of art is part of the Court of Honor on Wisconsin Avenue, where resides the most important sculpture in Wisconsin, the Civil War monument. 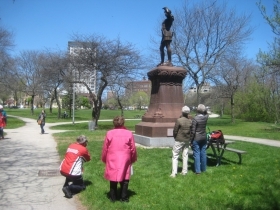 Due more than a century of the exposure to the environment on the busiest street in Milwaukee, the monuments in the Court of Honor need significant conservation. Westown and others are working to raise over $100,000 for this project.